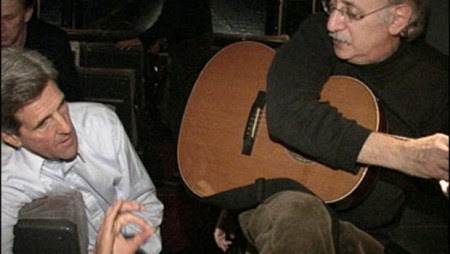 Peter Yarrow of Peter, Paul and Mary performed at Occupy Wall Street rallies, Anti-War rallies, John Kerry’s wedding and in Ho Chi Minh City to apologize for the Vietnam War. No word on whether Yarrow held a concert to apologize to the 14 year old girl he raped. Note to Subscribers - I have received a number of emails lately from people who say they haven't been receiving the daily emails. If you're having that problem, please email me to let me know. Several of the 9/11 family members speculated that the Obama administration is intentionally seeking to derail the hearings in a bid to bring them into federal court stateside. “So I asked [Mohammed’s lead defense attorney David] Nevin why does he do what he does. ‘Because I enjoy my job,’” Nevin responded. “So I asked [Nevin], ‘What’s it like to sit next to a guy and defend a guy who sawed off [reporter] Danny Pearl’s head? How does that make you feel? He wouldn’t answer the question, how he felt on a human level, how it feels to sit next to a cold blooded murder who sawed off a journalist’s head,” Arias recalled. “He wouldn’t answer. He started spouting Constitution and all this other stuff. Democracy is downright destructive in a political landscape in which Islamic political forces compete. Instead Blair’s new doctrine replaces democracy with religious freedom. That position, Blair continues, leads him to support the Egyptian uprising against the Muslim Brotherhood and even interim Assad rule until a final agreement is concluded. While that may not seem like much, imagine the last 15 years if the obsession with using democracy to replace dictatorships had instead been turned to promoting religious freedom at the expense of Islamic rule. Imagine if we made tolerance for Christians and other religious minorities into the defining line instead of the meaningless one of holding majority rule Muslim elections. Incidentally that means that some 1% of Muslims in Gaza are Africans, in part or in whole, and are fairly recent arrivals, rather than any kind of native residents of the land. Denis Mamadou Cuspert, who rapped under the name Deso Dogg, was a member of the Islamic State of Iraq and the Levant (ISIL) and was killed in a double suicide bombing carried out by Al-Nusra Front, a rival jihadist group that is Al-Qaeda’s Syria affiliate. Hilariously after spending so much time rapping about wanting to suicide bomb infidels, he got suicide bombed by his own Al Qaeda. I'm not going to spend time parsing what he said. There are a lot of people who have been the victims of injustice by the government. There are a lot of people who have lost property and even been sent to jail who would love a fraction of the attention Bundy has gotten. If you get to the point where you attract a lot of people to put their reputations and, in some cases, lives on the line, to protect your property, then the least you can do is to avoid doing anything to undermine them. I don't doubt that some of those people reached out to Bundy after his first comments and asked him to stop talking about race. He didn't listen. And there's a basic lack of respect in that. As a private citizen, you can say anything you like. But once you get people invested in your cause, you have an obligation to them. Not just to yourself. And failing to recognize that is selfish behavior. I wrote last week that there was no reason to expect Bundy to be perfect. The key players in the Boston Massacre certainly weren't. But if you're going to play a role in a movement, you have to be willing to think about the consequences of your actions to the people who support you. It means that as a conservative politician, you shouldn't commit adultery no matter how bad your marriage is, because aside from the moral issue, you are also undermining a cause that you have gotten people to invest in based on your character. And if you find yourself in a position where you have become the image of a particular cause, stick to that cause instead of venting your thoughts on other issues because the media landscape is polarized any there are teams searching through everything you say and have said to spot one sentence they can blow up into a scandal. Talk show hosts have gone through that ring of fire and know how to handle it, though they still make mistakes. A random person doesn't. If the issue is property rights, don't talk about race. Let someone like Ben Carson do it. Sudden fame can be a heady drug and reporters are always eager for quotes. Resist the urge to talk about your views on life. Reporters are not your friends. They're not interested in you because they respect you, but because they know that a damning quote can make their career. And this goes for all of us. The human ego is easily inflated. The media, on that end, plays expertly on egos. Its sends emails and letters eager to "tell your story". Never fall for it. If you find yourself in that role, think like a PR pro. Stick to the talking points that contain the message you want to put out. Don't wander all over the place and don't randomly begin giving them opinions on controversial side issues. If you do that, you're doing the enemy's work for them. The Bundy case couldn't have collapsed any better if the left had scripted it. And who is to say they didn't. The Committee on Human Reproduction was established around that time through the National Research Council Division of Medical Sciences which coordinated with Planned Parenthood. Its grants came through the Federal Security Agency, which was FDR’s creepy Socialist office that covered everything from Social Security to the CCC to the Department of Education to bio warfare research. MSNBC has become a strange cult. To join it, you just keep comparing everything to slavery. Like oil, which is just like slavery. Every time Chris Hayes gets driven to MSNBC in a limo, it’s like he owns 400 slaves. And the only solution is to bring back slavery. Or something. Hayes begins at Fort Sumter because if you’re pretending to be a progressive public intellectual, every policy critique begins there. Charter schools? Fort Sumter. Fat shaming? Fort Sumter. Common Core? FORT SUMTER. Manhattan’s oldest and most venerable comedy club on Turtle Bay approaches its 70th anniversary. Admission is free, but there’s nothing to drink and everyone keeps screaming the jokes in foreign languages. Unfortunately they’re all old jokes. Elect Saudi Arabia to a commission on women. Elect Sudan to a commission on genocide. Elect Iran to an arms control commission. Elect North Korea to a commission on democracy. Considering the billions we spend on this comedy club, they could at least get better jokes. Let’s summarize. Woman lives in building that bans pets. Woman picks up stray dog. Woman is told to get rid of dog. Woman gets shrink to write a note claiming that the dog helps with her depression. Building ignores silly nonsense and tells her to follow the rules. And neighbors complained that Aaron’s dog was a dangerous animal. Instead of everyone laughing and moving on, the worst US Attorney in history sued the building instead. Robbing banks helps me with my major depression over lack of money. And, by God! You should be able to rob banks at will, but only when you're cash-strapped and feeling blue! Besides, isn't robbing a bank enabling you to be social, like telling people to lie on the floor, and taking their money? And you should be indemnified against all criminal and civil charges, too. What if he needs huge piles of medical cocaine to fight his depression? That will require frequent hold-ups. We'll never win the war against robbing banks, let's just make it legal. Right. Laws? Way too hard to enforce, man. Kamal Al-Labwani: True, but the Arabs had also come and conquered this land. Such is history. People never stay put. The Armenians came, the Circassians, came, the Turks left, and the Ottoman Turks came, and now the Safavids are coming… “The land belongs to Allah, and He gives it to whoever He wills of his servants.” Nobody has a historical right to a piece of land. Historical right is a Nazi, racist, French, German concept, which has caused problems all over the world. Less than two weeks after moving in, Ryan informed Kat that it was not okay for Kat to use gender-neutral pronouns because “Kat is not trans” implying that only trans people are “allowed” to use gender-neutral pronouns, he also consistently refused to address Kat with the pronouns they use. Two videos of Israel's statehood from the newly opened British Pathe collection. Joshuapundit's letter to Baroness Ashton has already gone viral. Then you say you particularly deplore what you refer to as "confiscation of EU Humanitarian Assistance provided to vulnerable civilians in the Jabal Al Baba community in the E1 area." That 'community', as you call it, refers to a handful of Arab squatters living for a matter of a few weeks in EU-funded caravans in a contested vacant hillside within the city limits of the Israeli city of Maale Adumim, a city that Israel isn't going to give up in any peace agreement. And as we both know, E-1 is necessary to Israeli security needs in order to connect Maale Adumim to the rest of the Jerusalem area, so it doesn't become surrounded on all sides by those extraordinarily peaceful Arabs whom call themselves Palestinians. So in your world, Gush Etzion is a 'settlement' after decades of existence on legally purchased land, while a few caravans parked illegally for a matter of weeks on Israeli land with the EU's connivance that you give the name of 'Jabal Al Baba' is a 'community'? And Israeli Jews building houses is a settlement. Arab Israelis building houses isn't. Edward Cline writes about Justice Stevens' pathetic return to the spotlight. Meanwhile Stevens invalidates his own argument in one reply. "I do think that was what was originally intended, because there was a fear among the original framers that the federal government would be so strong that they might destroy the state militias." Well they would have wanted to do it, but they knew it was a bad idea because of people like me. Stevens's amendment makes no sense at all. The right to bear arms as a private citizen either is or isn't "infringed." If it is infringed upon, then the only time you can exercise your "right" is when you're working for the government enforcing the government's will at gunpoint (lawfully or unlawfully). Then, when the task is completed, you would hand the weapon you used back to the armorer. You may "bear" the arms, but not own it. If it isn't infringed upon, then you may own and "bear arms," certainly without leave of the authorities, and without having to serve in any government policing or military force. Period. The National Guard cut the throat of this entire line of gun control argument and lefties, like headless chickens, keep turning around in a circle. Either citizen's militias make a comeback or there can be no gun control. Since they hate both outcomes, they have to somehow argue to invalidate both based on government power. It's as if the government nationalized newspapers and then insisted that Freedom of Speech should only apply to newspapers and was never meant to apply to individuals. Brad Ford comments on one of my articles at The Right Side. Ironically, the future will look more like our barbaric past than people want to acknowledge. Empires will reestablish themselves with a vengeance. Family-based oligarchies will make a comeback. America and Europe will lose moral compass, drown in pop culture, steadily undermine their own identity, and NATO will become impotent. Russia and China have already abandoned Communism, but they will thrive in the same way that thuggish empires of the past did, but remain militarily ruthless. There is nothing to admire about Islam. I compared it earlier to a gang religion. It's what remains when a civilization collapses. It's a reversion to barbarism. Teri O'Brien comments on Obama's newest amnesty.
" ON BUNDY AND ON US" should be mandatory for every - EVERY - conservative candidate in every primary, election or press conference. What a marvelous distillation of simple, irreducible, ineluctable political truth. But then, politicians as a rule are not renowned for native decency and intelligence - just ambition and hubris that leads them to believe that whatever they have to say on whatever subject occurs to them is too important to leave unsaid. Otherwise they would not be interested in a career in politics. Perhaps that is the ultimate curse of democracy...?